Drosera binata. Photo Joanathan Gobbi. 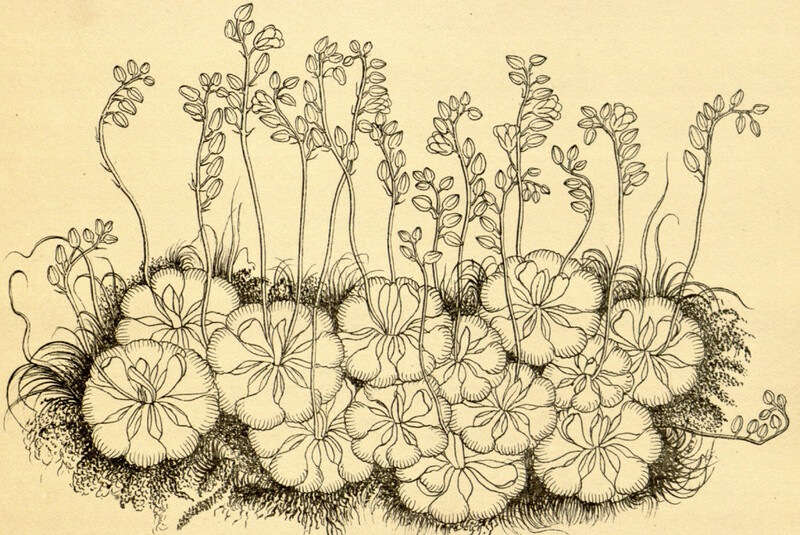 “At this present moment, I care more about Drosera than about the origin of all the species”, Darwin wrote to Charles Lyell in 1860, “but I will not publish on Drosera till next year, for I am frightened and astounded at my results”. In fact, he did not publish anything about it until 1875, when Insectivorous Plants [link] was released – the result of sixteen years of experiments with the sticky leaves of the plants commonly known as sundews (Droso is the dew in greek). Although the book also discusses other species of carnivorous plants, sundews take up about half of the book’s contents. Knowing they thrive in nitrogen-poor soil, he set out to discover that they make up for the lack of nutrients in the ground with those that they absorb from the insects they kill. Though sundews had been described by Linnaeus almost a century before, their dietary habits were not yet known. The surface of their leaves is spiky with tentacles, each with a drop of adhesive fluid on top which both attracts and captures the unfortunate passer-by. They also secrete digestive enzymes, turning their prey into a nutritious liquid that is then absorbed by the plant’s sessile glands (but since they lack an enzyme called Chitinase they can’t digest the insects’ exoskeletons and the leaves end up scattered with corpses). Droseras share this killing mechanism with other species like Roridula and Drosophyllum and the same general principle holds for Pinguicula as well. Droseras have a big advantage though: movement. When prey is detected, the surrounding tentacles bend towards it to better immobilize it, maximize its contact surface, and therefore digest it. Some species can curl their entire leaves around the victim – D. capensis can do it in record time, less than thirty minutes. But what is it that Darwin found so frightening? Besides the fact of a plant being carnivorous, which is frightening in itself, here Darwin was referring to the extreme sensitivity that allows the tentacles to react to the slightest contact – even that of a human hair (in this case probably Darwin’s) that couldn’t be perceived when placed on the human tongue (always Darwin’s). The same goes for their sensitivity to the substances he fed them (though the fact that he tried different dilutions does not mean he found proof for homeopathy [link]). That a plant can possess a sensory organ way more refined than any human counterpart is astounding indeed, as are the adaptations developed to avoid the waste of energy caused by unnecessary response. The plant can tell potential food from the rest (for example, raindrops), and even when the tentacles do contract to a mechanical stimulus, no digestive enzymes are secreted in absence of stuff to digest. To make sure of this Darwin left nothing untried – he even fed them crushed glass. They didn’t like it. I bought my first Drosera (a Capensis) in a small florist shop in Schöneberg three years ago. It has been prosperous ever since, and has generated offspring by leaf-cutting. In this species the new rosette of leaves grows from the centre and pushes the old one down. The stem gets pretty woody and looks like a miniature palm tree; new sprouts grow from the sides, giving it an impressive bushy appearance. It is native of South Africa and since its flowers often self-pollinate, it can silently colonize the pots around it – for that reason some would call it a weed, but we think it’s unfair. After capensis, Drosera aliciae is the second most common in the Blumenladen: another rosetted sundew from South Africa, with red leaves that lay flat on the ground and on top of one another. These plants are pretty but not so spectacular, so they are just marketed as a sidekick for the Venus flytrap, who gets all the spotlight. But Drosera can be more than that and if you want something fancier – a rare or weird variety – you can’t rely on luck and the shop on the corner; it’s time to find a good grower online and order the Drosera of your dreams! That’s how I got my hands on two highly decorative species: D. binata and D. filiformis. With D. Binata things get interesting, at least aesthetically: its main feature is its forked leaves – they make your plant look like a bouquet of Ts and Ys. This plant was also present in Darwin’s garden, having been first collected by Jacques Labillardière in 1792 and described in his 1804 book on the flora of Australia with the joyous title Novae Hollandiae Plantarum Specimen. Although the genus is distributed worldwide, almost half of the 194 species live in Australia, where sundews are thought to have originated. As is often the case with carnivorous plants, the fossil record is scarce and mostly made of fossil pollen – some of which has been found in Australia and Antarctica (pollen aside, the closest thing we have to a fossil Drosera is a recently discovered fossil Roridula [link]). Drosera binata. Photo Jonathan Gobbi. Australia is the land of endemism par excellence, so it’s hardly surprising to find so many weird varieties. In the case of Drosera this is also influenced by self-incompatibility, which affects many species. Self-incompatibility means that fertilization cannot occur between plants that are genetically too similar. A plant can’t pollinate itself, a clone, a cousin, or even just an acquaintance – the pollen gets killed at some stage and that’s all there is to it. This mechanism promotes outcrossing and leads to higher rates of speciation, but on the other hand, it makes it harder for the plants to colonize new territories. By lowering the chances of possible mates so drastically, it also makes it harder for plant nerds to cross-pollinate their plants, but that’s a problem I’ve never had because I’ve never tried to pollinate anything, so this is just hearsay. Nonetheless, they are very easy to propagate by leaf-cutting, and they also reproduce by parthenogenesis. So unless your goal is to get your name on a new hybrid plant, you can have all the clones you want; keep your plant from flowering by cutting the stem as soon as it appears – the flowers are pretty but inconspicuous and certainly not what you’re after. A recent study has notably disproved the common assumption that the remarkable length of the flowers’ stem was devised to prevent the pollinating insects from getting killed and eaten. Apparently this is not the case and this feature has more to do with the behavior of the pollinators themselves. 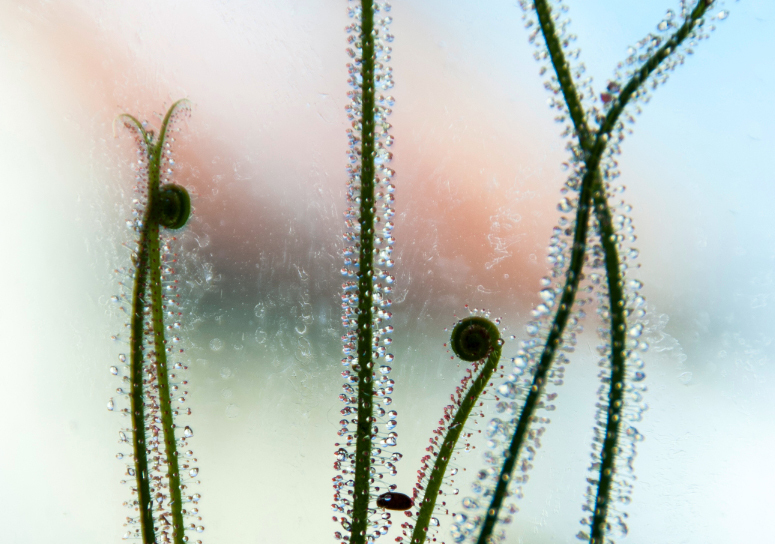 As for the spectacular Drosera filiformis from North America, its beauty is in the tubular, stem-like leaves. Bristly with tentacles all around like a real life Christmas decoration, they unroll from the tip as they grow just as Ferns do. This particular design prevents the leaves from relying on active movement as only the tentacles bend towards the prey. Drosera filiformis. Photo Jonathan Gobbi. 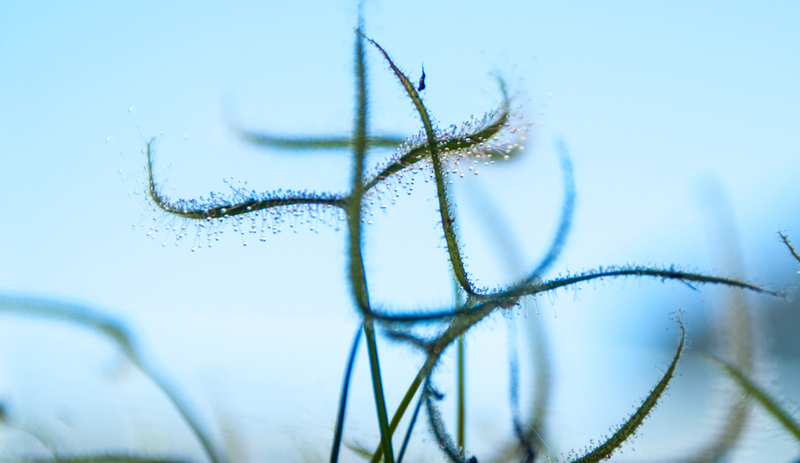 As far as Drosera is concerned, my ultimate goal would be to get one from the Petiolaris complex – this is not a band or a Freudian issue but an Australian subgenus of sundews in which the carnivorous leaf grows at the top of a long petiole, giving its striking appearance a taste of a marine organism, like sea anemones … but this will not happen until I get some more space on my windowsill. So for now, if I want more sundews I’ll be content with watching them on a computer screen. 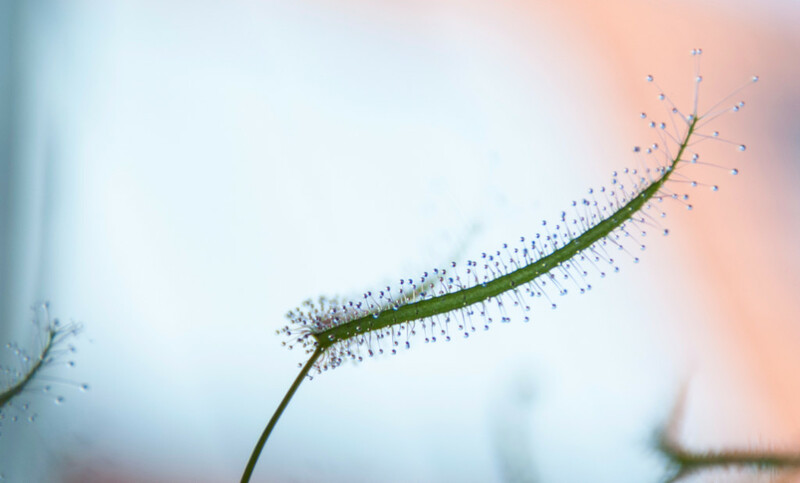 Which may prove fruitful in the end, as recently a new species – Drosera magnifica, the biggest in the Americas, nothing less – has been discovered in Brazil through a picture posted on Facebook [link]. Charles Darwin. Insectivorous plants. 1875. London: John Murray. Aamna Mohdin. “First carnivorous-plant fossil is 40 million years old”. Newscientist.com. 02 Dec 2014. –.“New carnivorous plant found on Facebook”. Nature vol. 524, p. 8. 06 Aug 2015.